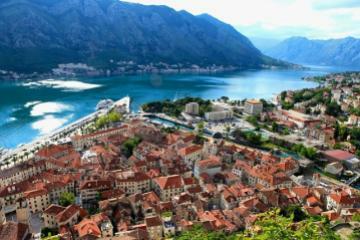 Montenegro is one of the youngest, smallest and least populated countries in Europe. It covers almost 14.000 square kilometers and has population slightly over 650.000 (not even a million). 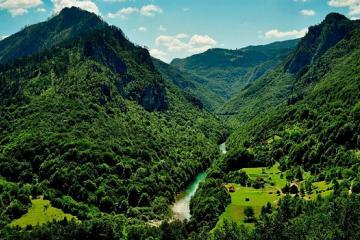 It is situated in south-east Europe, on the west of Balkan Peninsula. Montenegro has a coast of the Adriatic Sea and it’s bordered with Croatia, Bosnia, Serbia and Albania. The two farthermost points in Montenegro are 190 kilometers apart in straight air-line, which literally means that it would take you about 5 hours by car to pass from one part of the country to another. Still, between them the North Pole and the Equator seem to meet. 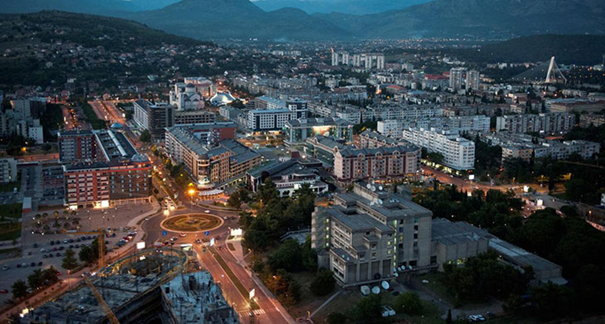 Capital of this small state is Podgorica (earlier named Titograd, by president of Yugoslavia at that time) with no more than 200.000 residents, which points that almost 1/3 of all habitant lives in capital city. 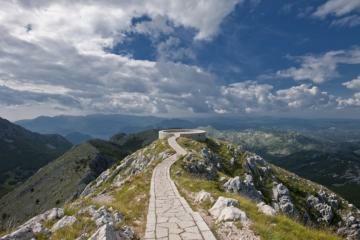 Montenegro has as well an Old Royal Capital - Cetinje, which represents cultural and historical center of the state. Official language is Montenegrin, but Serbian, Bosnian, Croatian and Albanian are also in usage. Major religious orientation is Orthodox Christianity, while only one non-Christian religion that forms majority in certain regions is Islam, amounts to 19% of the total population of the country. What is nowadays called Montenegro (literally “Black Mountain”) or Crna Gora in local language – has gone by many different names in the course of its long and stormy history. Its current name superseded the medieval appellation of Zeta state. It probably dates back to the era of Venetian reign over this entire area in Middle Ages. According to the legend, Montenegro owes its present name to seafarers who spotted a region so close to the sea yet completely cut off from it by the mountains rising straight from the shore. These mountains appeared to the mariners as huge dark elevations. Thick forest didn’t allowed much sun rays on the ground, so they had feeling like being in the dark all the time. Hence name the “Black Mountain”. 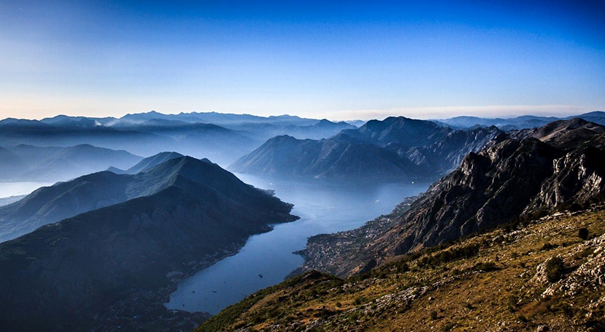 Montenegro is a coastal, continental and mountainous country. 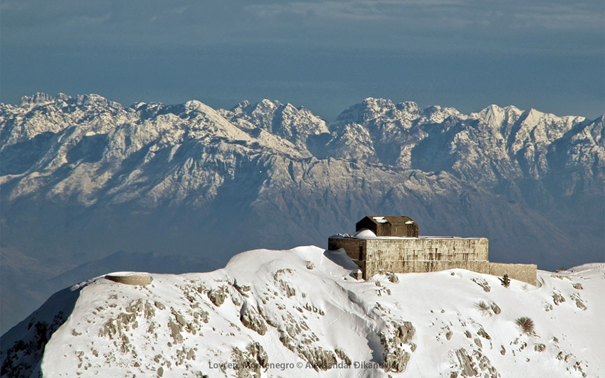 It ranges from high peaks along its boarders with Serbia and Albania to a narrow coastal plain on the South. 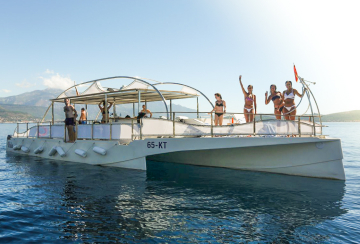 It is separated in three geographical zones: Adriatic coast, Middle continental part and Mountainous northern Montenegro. 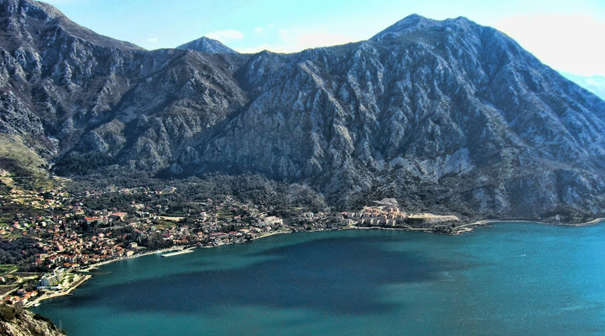 Various geological composition and the richness of relief forms in Montenegro represent an exceptional natural basis for the development of tourism. The shore of Montenegrin littoral length (293,5 km), gulfs, bays, cliffs and beaches, are, without doubt, the most attractive part of the land in this region. In this we count magnificent Boka Kotorska Bay as well, “the bride of the Adriatic”, which is listed among 25 most beautiful Bays in the world. Several islands along the coast – St. Niklolas near Budva, Mamula near Herceg Novi, Our Lady of the Rocks and St. Georgie across Perast and many others contribute to the richness of the landscape. 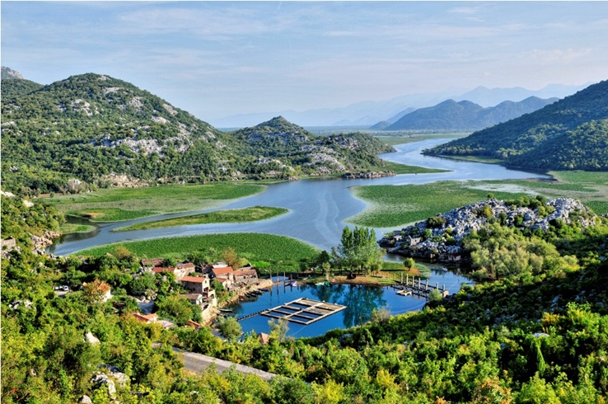 The sudden rise of mountains from the seacoast, the vertical massiifs of Orien (1.895 m above sea level), Lovćen (1749 m) and mountain of Rumija (1.593 m), provide a special contribution to the astounding sight. 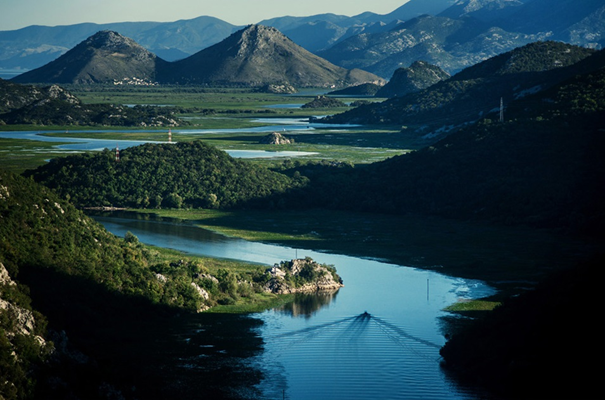 Behind the middle karst area, 100 km form the sea-shore, there are mountain ranges crisscrossed by river-beds and valleys. The dramatic impression of the relief is considerably strengthened by 55 mountain peaks at an elevation of more than 1.800 m located in the northern, mountainous part of Montenegro. 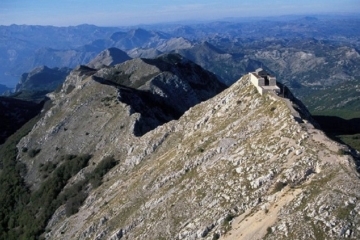 The best-known highest mountains are Durmitor (2.522m at Bobotov Kuk Peak), Prokletije (2.534 m at Zla Kolata Peak), Sinjajevina, Bjelasica and Komovi Mountain. In addition to the various forms of summer tourism (hiking, mountain climbing), winter sports (skiing and snowboarding) is developed here. 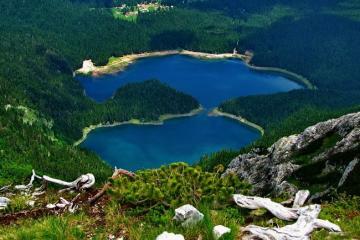 Montenegro abounds in lakes. 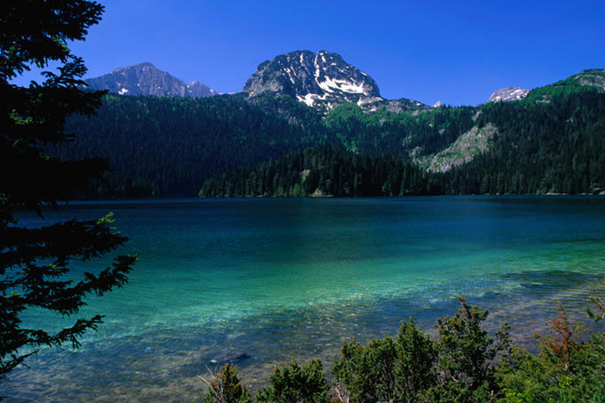 The lakes known far and wide are lakes of Durmitor and Bjelasica Mountain (Black lake so-called “Mountain eyes”), between them is also Plav and Šaško Lake, while the biggest lake in Montenegro and Balkans is Skadar Lake (70%:30% shared with Albania). 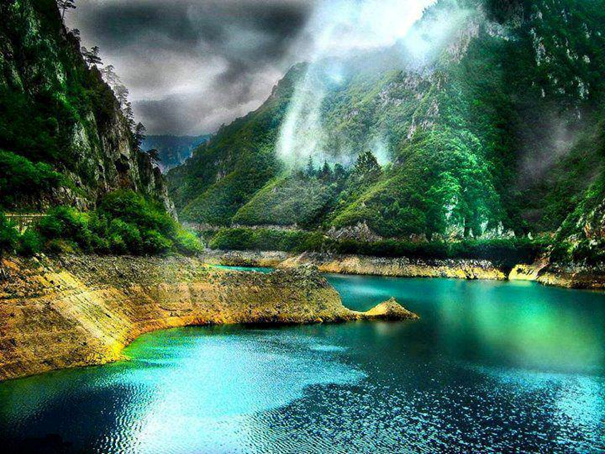 Rivers are particularly attractive features in Montenegro. The most important of Montenegrin rivers are Tara (“tear of the Europe”) well known by its world’s second biggest canyon, right after The Great Canyon, and as a best place to do rafting, and surprisingly the water is drinkable; then Piva (with Komarnica) with its amazing blue colour, Morača, Lim, Zeta and many others. There is, probably, no geographical area as small as Montenegro with so convoluted and turbulent history that left this much legacy behind. The stormy history has left a rich collection of monuments dating from various civilizations and cultures that had existed at this land. The first data on ethnical communities that lived in this area originate from 2000 – 1500. year BC. Today’s Montenegrin land first was habited by The Illyrians who arrived during the late Iron Age. By 1000 BC a common Illyrian language and culture had spread across much of the Balkans. Maritime Greeks created coastal colonies on the sites of some Illyrian settlements around 400 BC. Thereafter Hellenic culture gradually spread out from Greek centers, particularly from Bouthoe (Budva). The Romans eventually followed. The Illyrian tribe was the major problem for Romans and Greek because of their piracy and steal. 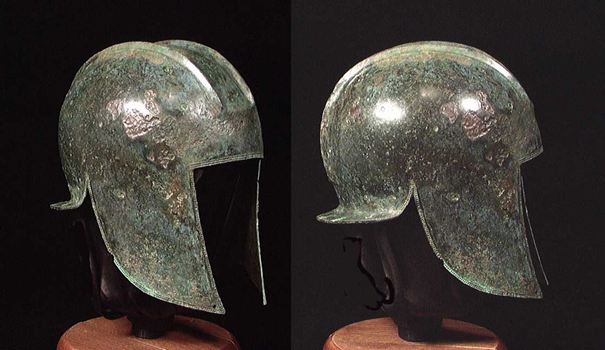 The initial impetus for the Roman incursion came when, in 228 BC, the Greeks asked for Roman protection from an Illyrian Queen Teuta. The Romans capitalized on this entrée to fully absorb the Balkans into their provinces by 100 BC. They established networks of forts, roads and trade routes. 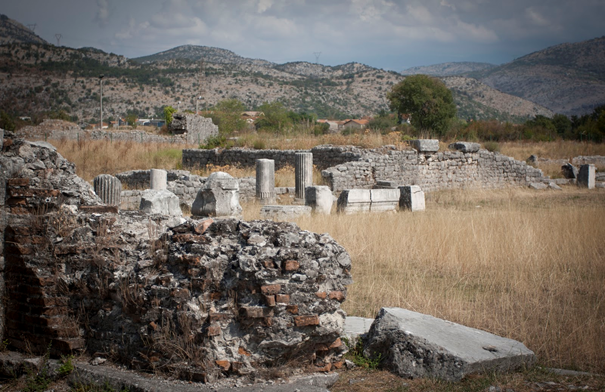 During the Roman Empire, the territory of Montenegro was actually the territory of Duklja (Doclea) located near todays capital Podgorica. When the Emperor Theodosius died in 395 AD, the Roman Empire split into two, Boka remained under the Western Empire, while the rest of the country came under Byzantium. Slavic tribes arrived from their motherland - which was in present-day Poland and the Baltic, and gradually settled on the territory of Prevalis. They accepted Christianity very quickly, and the first Slavic state was formed under the formal sovereignty of the Byzantine Empire. 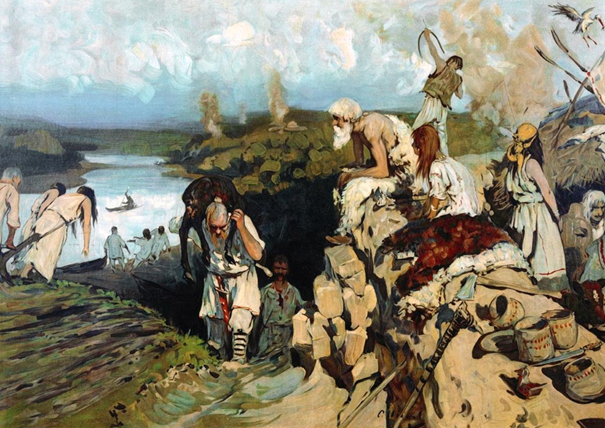 At the end of the 6th and the beginning of the 7th century Slavic tribes, ancestors of contemporary population of Montenegro, began to settle on this territory. The first state established by Slavic tribes on the Montenegrin territory dates back to the 9th century. Its name was Duklja, derived from the denomination for the area these tribes inhabited. The first ruler of the Duklja state was Duke Vladimir (990 – 1016.). His successor was duke Vojislav, who is considered the founder of Vojislaveljević dynasty, the first Montenegrin dynasty. 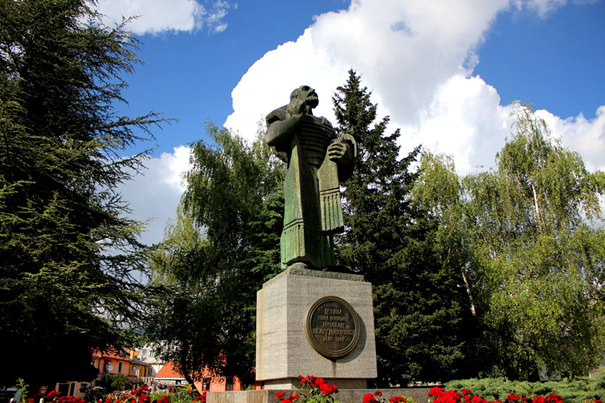 One of Vojislav's sons, Mihailo, who ruled over Duklja from 1050 to 1081, succeeded in being admitted as a king. Vojislavljević dynasty ruled over Duklja until the end of the 12th century, when Duklja state was conquered by Serbian ruler Stefan Nemanja. The area of Montenegro was under rule of Serbian lords until the beginning of the second half of the 14th century, when local dynasty – Balšići – regained power. They represent the second Montenegrin dynasty. After Balšići, Montenegro is ruled by Family of Crnojevići (1451- 1496) – the third Montenegrin dynasty. In this period, Montenegro is increasingly exposed to the attacks of the Ottoman Empire, which conquered it in 1496. Montenegro was the last of the Balkan states to lose its independence. Only several decades later, Montenegrin people start their struggle for freedom, which resulted in success in late 17th century. Montenegro became first independent state on the Balkans. Thus began the new era of Montenegrin history, marked by struggle to keep independence and efforts toward state building. At first, head of the state was religious leader – metropolitan, and later on the state was governed by secular ruler, both from the dynasty Petrović-Njegoš. Seven rulers of Montenegro originate from this dynasty. Petrović-Njegoš is the fourth Montenegrin dynasty (1697-1918.). Montenegro, as a free and independent state was proclaimed principality in 1852. Its independence was admitted by all great powers, except for the Ottoman Empire and the Great Britain. However, not before 1878. at the Berlin Congress, the independence of Montenegro was accepted by all the states that haven’t done it before. Thirty-two years after the Berlin Congress, Montenegrin Duke Nikola I Petrović proclaimed The Kingdom of Montenegro, in 1910. Montenegro joined the World War I siding with the Entente Powers, suffering great victims and devastation. After the war ended, the Kingdom of Montenegro was, with the consent of the great powers, adjoined to the Kingdom of Serbia, and its dynasty was dethroned. 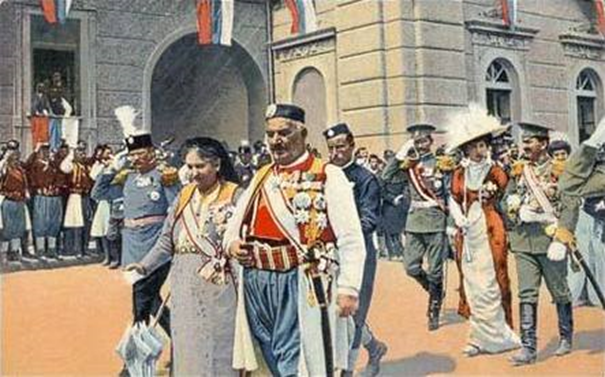 The Kingdom of Serbs, Croatians and Slovenians was created, which, in 1929 became Kingdom of Yugoslavia, with Montenegro being part of it. 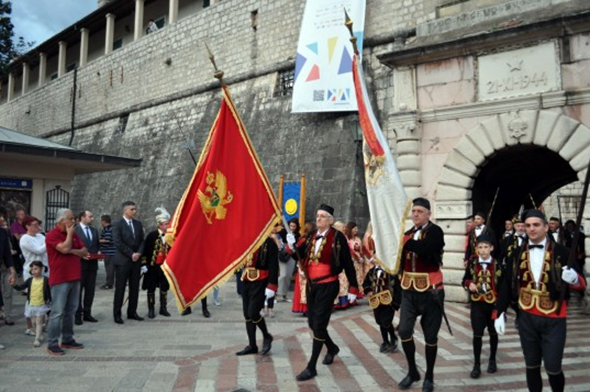 This new state did not recognize neither Montenegrin identity nor its historical heritage. Montenegro didn’t even exist as a geographical denomination, being part of so called Zeta Banovina, within broader administrative borders. Montenegro and Montenegrins were reaffirmed during the World War II, when this area becomes one of the strongest pillars of antifascist resistance in Europe. In 1941, in Montenegro, the most numerous people’s uprising in occupied Europe happened. Montenegrins were also significant part in overall Yugoslav antifascist movement. After the 1945, and the creation of socialist Yugoslavia, led by Josip Broz Tito for over three decades, Montenegrin state and national identity was fully recognized. 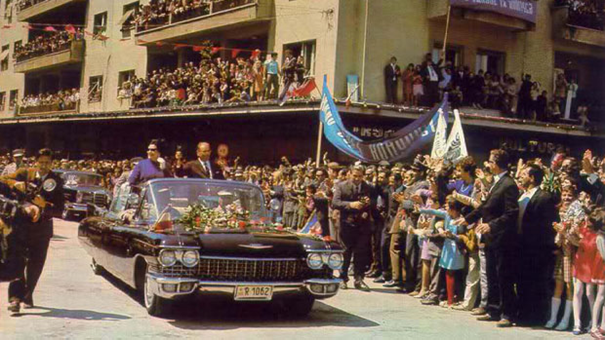 This was the time of the greatest socio-economic and cultural progress in the history of Montenegro by that time. During the time Yugoslavia was dissolving (1991.) Montenegrins decided to continue to live in federation with Serbia, which soon proved to be unsustainable and dysfunctional. For this reason, from 1997 onwards, the process of alienation from the Belgrade regime and reaffirmation of Montenegro’s independence started, followed by strong dedication to democratic reform, good cooperation with neighbors and European and Euro Atlantic integration. Montenegrin government, headed by Prime Minister Milo Đukanović, on the basis of the Belgrade agreement which created State Union of Serbia and Montenegro, with the help of the European Union, succeeded in creating conditions to organize a referendum on state independence in 2006. Referendum was held on May 21st 2006, and the absolute majority of Montenegrin citizens (55.5%) upheld the idea of reaffirming Montenegrin independence. At the time, the European Union set up unique referendum conditions, so far unknown to the democratic praxis of Europe. 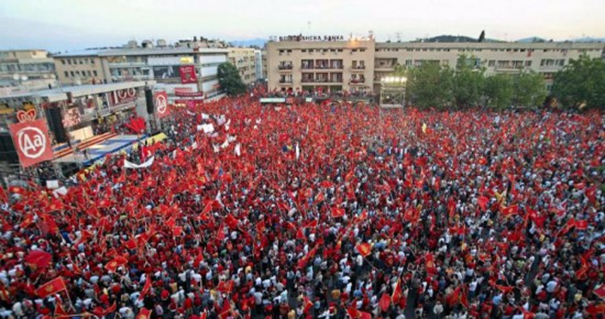 Montenegro thus became the first country in long history of the Balkans created in peaceful, democratic manner, according to the highest European standards.